Product prices and availability are accurate as of 2019-04-22 10:46:34 UTC and are subject to change. Any price and availability information displayed on http://www.amazon.com/ at the time of purchase will apply to the purchase of this product. 1 pc 3" brass plated crimped wire cup brush & 1 pc knotted steel wire cup brush. Ideal for removal of rust, corrosion and paint. 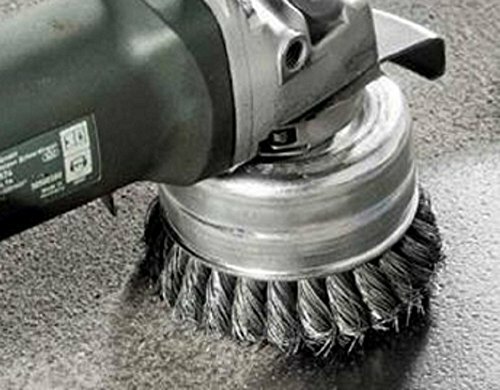 For aggressive brushing, the steel twist knot cup is long-lasting and gives great flexibility in a wide variety of heavy-duty applications such as edge blending and removal of paint, coatings, rust, mill scale and weld slag. 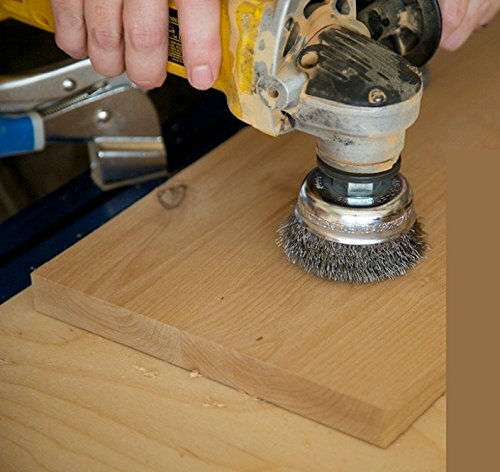 Katzco provides high-impact brushes for faster removal rates on tougher jobs. Katzco's wire brush line includes a multitude of offerings that include all the basic shapes, cups, wheels, and brushes. So What are you waiting for? Get a quality product that is affordable and will last with Katzco. WHAT IS IT: 1pc 3 Inch brass plated crimped wire cup brush & 1pc knotted steel wire cup brush. Ideal for removal of rust, corrosion and paint. 1/4"" shank fits all drills. Hardened steel wire for reduced wire breakage & long life. Maximum 4500 RPM. THIS PRODUCT: Is Suitable for multiple uses. Keep one in your car, garage, office and kitchen. With 100% satisfaction USE FOR: Innovative spiral knotted wires construction for a narrow face and precision deburring, rust, spatter and paint removal, surface conditioning and preparation. 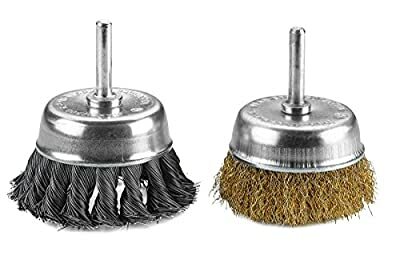 HIGH QUALITY: Katzco offers the finest quality Knot Wire Cup Brushes to give you long service on the toughest cleaning jobs. These cup brushes are ideally suited for cleaning castings, structural steel and sheet metal. WHY CHOOSE US: When it comes to purchasing your tools, you have plenty of options. However, a reputable company that cares about you and your project will help you experience a better result. Katzco has a large variety of tools, accessories and supplies to meet your immediate needs and your needs in the future.